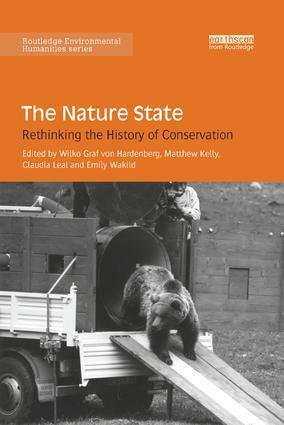 This volume brings together case studies from around the globe (including China, Latin America, the Philippines, Namibia, India and Europe) to explore the history of nature conservation in the twentieth century. It seeks to highlight the state, a central actor in these efforts, which is often taken for granted, and establishes a novel concept – the nature state – as a means for exploring the historical formation of that portion of the state dedicated to managing and protecting nature. Following the Industrial Revolution and post-war exponential increase in human population and consumption, conservation in myriad forms has been one particularly visible way in which the government and its agencies have tried to control, manage or produce nature for reasons other than raw exploitation. Using an interdisciplinary approach and including case studies from across the globe, this edited collection brings together geographers, sociologists, anthropologists and historians in order to examine the degree to which sociopolitical regimes facilitate and shape the emergence and development of nature states. This innovative work marks an early intervention in the tentative turn towards the state in environmental history and will be of great interest to students and practitioners of environmental history, social anthropology and conservation studies.